Lastly, individuals can also cause groundwater contamination by improperly disposing of waste. 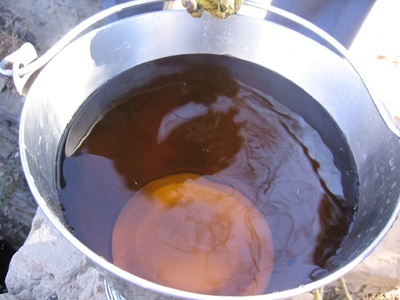 Motor oil, detergents and cleaners can leak into water sources. Importantly, groundwater can also be contaminated by naturally occurring sources. Soil and geologic formations containing high levels of heavy metals can leach those metals into groundwater. This can be aggravated by over-pumping wells, particularly for agriculture. This is the case in much of Bangladesh, where groundwater contains high levels of naturally occurring arsenic. One study indicated that a full one fifth of the population drinks water containing 5 times the arsenic level recommended by the WHO7. Groundwater pollution differs from surface water contamination in several important respects. Among them, it does not typically flow to a single outlet. It can affect people through wells dug in a contaminated aquifer, as it can flow into streams or lakes. Groundwater pollution also occurs on a different timescale than surface water contamination. Flow rates vary widely and can be as slow as 2 miles a year. Because of this, nonpoint source pollution can take years or even decades to appear in wells and just as long or even longer to dissipate or be converted. Groundwater pollutants can enter the body directly through water supplies or by eating foods prepared with contaminated groundwater or grown in fields using contaminated sources. It may also affect humans when they are in direct contact with polluted waters. Health effects from groundwater pollution depend on the specific pollutants in the water. 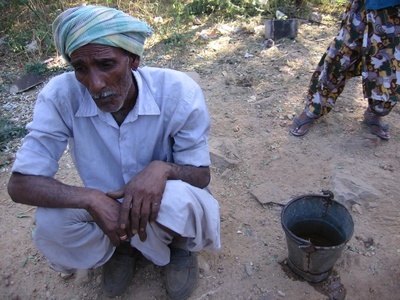 Pollution from groundwater often causes diarrhea and stomach irritation, which can lead to more severe health effects. Accumulation of heavy metals and some organic pollutants can lead to cancer, reproductive abnormalities and other more severe health effects. Groundwater is very difficult to remediate, except in small defined areas and therefore the emphasis has to be on prevention. This is based on protection of sensitive aquifers, control of discharges and releases and provision of drainage and sanitation systems to avert pollution discharges. For small areas of highly polluted groundwater, it may be possible to pump out, treat, and recharge (which is expensive); to treat in-situ – for some contaminants; or to try to contain the pollution “plume”, physically or chemically. However, there is continuing degradation of important groundwater aquifers in many countries, the serious impacts of which are only slowly being appreciated. A bucket of water drawn from a polluted well. India. Photo by Blacksmith Institute. Discolored polluted water. India. Photo by Blacksmith Institute. Polluted ground water especially affects poor communities without the resources to use other sources. Bhiwadi, India. Photo by Blacksmith Institute.